Be the first to hear about their new releases and deals. Download the Booksprout app and search for Shei Darksbane today! Check out http://Darksbanebooks.com for more information and sign up to our newsletter for updates, special offers, and exclusive content. 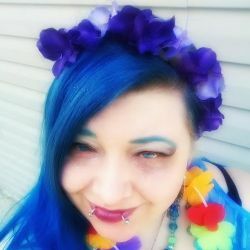 Shei Darksbane is a blue-haired geek with a love of awesome stories of all kinds whether they come in the form of books, shows, movies, comics, roleplay, video games, music, art, theater, etc. She is a proud lesbian and feminist, a human rights activist, and a passionate person in general who loves the wonderful, beautiful world and the incredible creativity of humankind. She refuses to give up believing in magic, fairies, and monsters under the bed, and she feels sorry for those who do.